Sibelius’s music is all Nature. On a personal note: my 1 1/2-year-old son sat by my side as I compiled this playlist. He kept saying “No! No!” when he heard/saw the videos. But trust me, it’s not that he didn’t enjoy the music: “no” is just how he says “piano” right now. Click through below for more videos. Enjoy! Our new header image shows the huge performing forces that were needed to perform Mahler’s 8th. 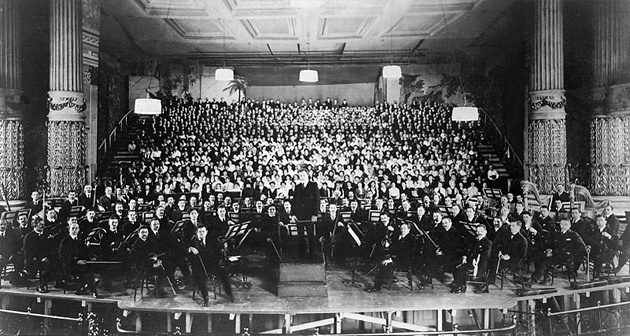 The photo shows Leopold Stokowski’s U.S. premiere of the symphony. Ambitious goal, that. To Mahler, the artistic aim to create a “universal symphony” translated into expanding both the size and scope of the ensemble and the form. Where the average symphony up until then typically had first movements lasting roughly 10-15 minutes in duration, Mahler upped the ante to over 20 minutes in Sym.2 and over 30 in Sym.3; where the usual, humdrum orchestra had 4-6 horns, for instance, Mahler brought in a cavalry of 10 parts for Sym.2. In order to express the universal, it seems, everything needed to be larger. RT calls this expansion of symphonic means and ambitions “maximalism,” a term that implies an uncompromising dedication to the extremes. It’s a fascinating fin de siecle paradigm that shows up in areas outside of music as well (one recalls a particular super-sized ocean liner..). You have to wonder how much of this “maximalization” of the symphony had to do with expanding the expressive range of the orchestra to encapsulate the whole world (nay, the universe), and how much of it had to do the same sort of hubris that lay behind the construction of the aforementioned ocean liner. I’m an ardent admirer of Mahler, but there’s a lot of arrogance mixed in with the audacity here (first, to think that the “universal” is musically possible; second, to think that he would be the one who could do it). There’s an odd conflation of universality and philosophical serious-mindedness with massive orchestral forces, volume, and duration. Could not a Mozartean symphony also be “universal,” or are claims of universality proportionately related to size, making the “small” simultaneously the “non-universal”? As a companion term to RT’s “maximalism,” I might suggest “gigantism” as another designation of the ballooning of orchestral forces, time scales, and philosophical ambitions during this period. The OED defines the word as “abnormal or monstrous size,” and in the context of the book so far (and music after the first decade or two of the 20th century), Mahlerian scale does indeed represent something abnormal. Both maximalism and gigantism work in tandem here: ambitions were extreme, but the equation of expressive range (“the whole world in a symphony”) with size expresses a “bigger is better” mentality as well. To the music indeed. Over the last couple of weeks, Zach and I have been wrapping up our comments on Vol. III (19th century). We both realized that the “wrapping” could indeed go on and on, and that we must move forward. So here we are at the dawn of Richard Taruskin’s next volume, Music in the Early Twentieth Century (his account of the century comprises two volumes). And the first musical example we are introduced to is the first movement of Mahler’s Symphony No. 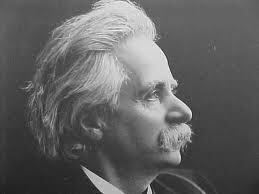 2 in C minor, first premiered in Berlin in late 1895. The movement is called Todtenfeier (“Funeral Rite”). Consumption, not production. This is a radical up-ending of the 19th-century nationalist narrative (see my recent post on Elgar). It’s supposed to matter where you’re from (production), not how you’re marketed (consumption). But Taruskin is right on this one. Has any composer entered the canon without the benefit of a highly influential advocate, whether of their own time or later in history?